Bharat Sanchar Nigam Limited (BSNL) has announced the launch of a new plan for its CDMA users in its Kerala Telecom Circle called the ‘BSNL JOY Prepaid’. Under this plans BSNL CDMA users will be able to enjoy making all Local and STD calls to other BSNL numbers at just 1p/2seconds and all other calls at just 1p/second. The BSNL JOY Prepaid plan can be opted into by any BSNL CDMA users in Kerala for a nominal charge of just RS. 85 which will also offer them freebies such as 250 minutes of Local BSNL calls, 500 SMS and 50 MB of data usage for 30 days. Apart from the 1p/2second pulse for BSNL numbers all over India and 1p/second for all other calls, users will be able to send Local SMS at just 50p/SMS, national SMS at 60p/SMS and international SMS at Rs. 5/SMS. 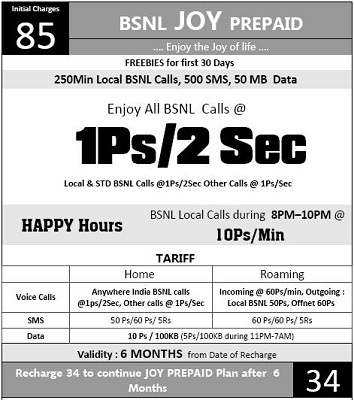 BSNL has also introduced Happy Hours calling for users of this plan, under which they will enjoy Local BSNL calls between 8 PM -10 PM at just 10p/minute. Roaming charges under this plan are also nominal as all incoming calls outside the Kerala circle would be charged at 60p/minute and all outgoing calls to Local BSNL numbers would be charged at 50p/minute, while calls to all other numbers would be charged at 60p/minute. Data usage would be charged at 10p/100KB during normal hours and at night between 11 PM to 7 AM, only 5p/100KB would be charged by BSNL. The validity of this plan is 6 months and after the end of validity, users will have to go on to a Recharge of Rs. 34 to continue JOY Prepaid plan for another 6 months.